Getting a copy of your Russian birth certificate is fairly simple. If you're located in Russia, just contact the city clerk's office. If you're outside the country, enlist the help of an attorney. If you are in Russia, you can go to the City Clerk's office (ZAGS). It is an office where you can obtain archived documents and marriage licenses for example. Ask them to look you up by the name that you were born with. If your name has been changed, your birth name will be crossed out in the records and the new name should be written in. Ask the office to print you a new birth certificate, they should be able to do it on the spot, if you are willing to wait. If you are located outside of Russia, you can obtain a POA (Power of Attorney) to obtain documents. Make sure to get the POA notarized. If you were adopted or if you got married through an organization, contact them for their attorney, they might do it for free. Otherwise, contact a Russian attorney in Russia. Look into local Russian newspapers or contact the Russian consulate to obtain a name of a willing attorney that can help you. You have to make sure the power of attorney is notarized and contains all necessary information that the lawyer may need. Necessary information includes: numbers of any Russian documents such as a passport that you may hold, number of American passport, your current address, the names of your parents at birth, the name of adopted parents, date of adoption. Make a photocopy of the back and the front of your birth certificate as soon as you get it. Do not fold it, as some inks used in Russia rub off very easily. My birth certificate was creased at the place it has the number, and now I no longer know the number of the birth certificate. If you get a birth certificate from Russia, it is of no use in a foreign country unless it has an "appostil" on the back. "Appostil" is a stamp required to validate that birth certificate in a foreign country. Ask your attorney or the city clerk where is the nearest location you can get one in. Contributor. "How to get a copy of your Russian birth certificate." 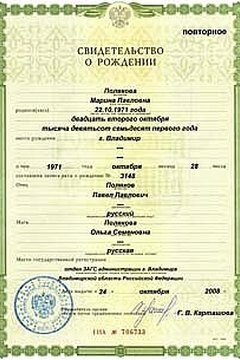 , https://legalbeagle.com/5189742-copy-russian-birth-certificate.html. 14 April 2017.